Asp ire Academy Trust operate the Aspire Teaching Trust (ATT), delivering primary teacher training in our Aspire schools across Cornwall. Our teacher training programme follows the School Direct (tuition fee) route, offering a wealth of hands-on experience, with successful completion leading to Qualified Teacher Status (QTS). Vacancies to train to teach with Aspire Teaching Trust for a September 2019 start are now full. We will reopen for recruitment for training beginning in September 2020 in the Autumn. Why choose Aspire Teaching Trust for primary teacher training? Career prospects. Training with us is the start of an Aspire career. On successful completion of Initial Teacher Training and achieving Qualified Teacher Status, where vacancies allow, trainees will be offered a teaching job in one of our academies. Teacher training can be a stressful and busy time, so we'd like our trainees to focus on their trianing and developing practice, without the added pressure of application forms or interviews. A personal-issue laptop for the duration of training to connect and be fully integrated into the Aspire networks and our online community of resources. Dedicated mentor time with excellent class teachers to develop practice. Our class teachers working with trainees also have access to mentoring themselves to help them give complete support to trainees. All placements in Aspire schools, carefully chosen to give trainees the best experiences. Support from a wide range of expert practitioners and teachers across a range of areas. Three-quarters of the initial teacher training year is spent in our schools, with the remaining 25% of the time spent on centre-based training with our training partners, the Ofsted Outstanding Cornwall SCITT. The School Direct (tuition fee) route means that trainees can learn on-the-job, whilst working towards Qualified Teacher Status. There is a close relationship with the placement schools. The School Direct (tuition fee) route gives trainines an optional PGCE route; this gives a balance of practical, school-based training to achieve QTS while completing a PGCE. 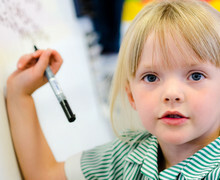 Trainees can choose to specialise in early years (ages 3-7 years) or train in general primary (ages 5-11). Both routes will qualify trainees to teach right across the primary age range - the choice of route will guide what age classes trainees are placed in. Aspire Teaching Trust hold a series of informal information sessions for prospective trainees to find out more about primary teacher training with us. This is the ideal opportunity to visit us, find out more about what we have to offer as well as to chat informally about the programme. We will be announcing dates for upcoming information sessions in due course, when we move into the next recruitment cycle.